When the notorious "pimp and whore" visited ACORN offices with their candid camera, an ACORN adviser instructed them that "Honesty is not going to get you the house," unwittingly revealing the political philosophy of the entire progressive movement. That includes ACORN itself, which wouldn't be able to operate if it were honest. That also includes the Democrat Party that fed off Fanny Mae and Freddy Mac issuing mortgages with ACORN's help to people who got houses without paying for them. That also includes Nancy Pelosi who got the House of Representatives, and even the President, who got the White House. The only time ACORN workers were honest, was with the "pimp and whore" because they had taken them for their own kind. For that they had been later purged. In fact, they should've been put against the wall by the Party for disclosing its most important secret. Now anyone with half a brain will be able to cut through the Party slogans and, as if wearing magic glasses in a B-grade movie, read the real message loud and clear: "Honesty is not going to get you the house." Damn! I got to get me a pair of shades like that! If you got shades just like Dear Leader, then, what difference would there be between the two of you? With the exception of the "One Planter, One Bullet" operation, there would be almost none. You'll see, it won't be long before he catches up with you in the money printing department, and with the Cap and Trade bill now being written to spare the coal companies, but sock it to the oil companies, he will own the oil companies before long, and he'll find some way to nationalize the farms. Now don't tell me that if they are well on their way to nationalizing the banks and the car companies, and 1/6th of the economy with the Health Care Bill by forcing all health care workers into unions, that they will stop there. And, I wouldn't be surprised if Comrade Fidel has already sent consultants to Washington, as he did to you in Zimbabwe. So, you really need to find another way to distinguish yourself, lest people get you confused. Oh, wait a minute, you've already figured that out. Your name is a hybrid between the two of you. I got so carried away with what I was saying to Comrade Obamugabe that I forgot what I was going to say to you. Sorry. Oh, now I remember. Are you implying that Dear Leader is a liar? How dare you! Meez to! Dims arah some coolass shades! If Ihaz dim, I dont need no telpromtur. Is that an island accent, Comrade Brother Goody? It seem so, and an excellent one I might add. I'm getting my own pair of shades ASAP. If only we here in Amerika could be so lucky, dear leader Obama is on his way to making this possible for all of us though. I am glad you are able to appreciate the Miracle that is Zimbabwe! You are welcome to come and live under my benevolent tyranny rule! 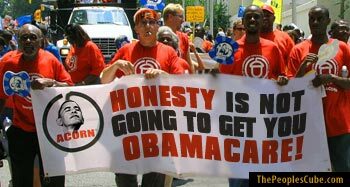 Honesty is not going to get you health care! Obama camp plants fake doc, Che fan at Jackson Lee forum. If Obamacare is so great and is supported by all doctors and nurses, why the only doctor backing it at the meeting was a lying prog impersonator? Horse hockey, I think it might be another troll. He may well be, Commissar Elliott. If anyone can spot them, it is you, coming from the People's Republic of Pancake Feeds and Ketchup where trolls litter the streets. He may well be, Commissar Elliott. If anyone can spot them, it is you, coming from the People's Republic of Pancake Feeds and Ketchup where trolls litter the streets.Hahahaha. . . well, when you are surrounded by them, it's only natural to understand their means, and droppings. No, but the word 'goodie' is suspiciously troll-ish. Let's form a circular firing squad, comrade, for the greater good. The phase "all your base are belong to us" sounded suspect, and we're still getting over some recent troll postings, ergo, you sounded a little suspicious Terry. Troll? TROLL? Where's the troll? I want a troll. I miss Gollum. Perhaps we need to come up with some kind of troll bait in the form of a luring post to the People's Blog. Like: I hate Wal-Mart, or Sarah Palin is a Bimbo Moron. I'd rather have them come in to teach us a lesson. Perhaps we ought not come on gangbusters. I never did learn how to play a troll right; I get pissed off after a short while and then start firing all weapons. But a troll should be cherished, and played, and then at the final minute, destroyed.